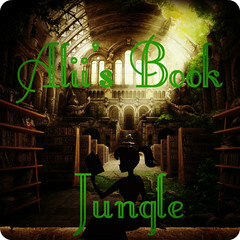 Hello book junkies, I'm Alii and this is my very own book jungle. A little about myself. I am 26 years old, an English and History Graduate and most importantly a complete and utter book junkie. Presently my Kindle is the love of my life, I'm literally never without it. I feel it's only fair to warn you I'm just teensy bit crazy *holds thumb and forefinger apart*, when it comes to books I can go on forever, and have a tendency to majorly geek out so sometimes I may sound completely unhinged, but I'm sane I swear. So relax and enjoy your time in the jungle. This site offers all kind of book goodness, let's see now...there's cover reveals, teasers, giveaways, excerpts, blog tours, release dates and of course reviews. Oh and there's an about me page, teaser section with my own designs subsection, inspirational and personal quotes and ah yes a little contact me section. Phew, I think that about covers it. So have a wander round, and just click on the links or search if you get a little lost. I hope you have a wonderful adventure in the jungle, and don't be afraid to like, follow me or grab my button.